My Place: He aint heavy, he's my brother! Two things for you this week, heavy and light! First the heavy. I have got my oils out again; I have found some gloves that isn’t too distracting to protect me from my allergy to oil or turpentine. It is a work in progress. It is about how we deal with the dark and light in our life. For me, being a Christian I can lean on Jesus and God for guidance in difficult times. Others have different belief systems and use that for hope. However there are many people out there who don’t have a faith of any sort and when things go wrong, it is so difficult for them to cope and depression can set in. This is happening to someone close to me, and it breaks my heart. Hope is what gets us through. It is quite a large painting, about 30in x 36in. 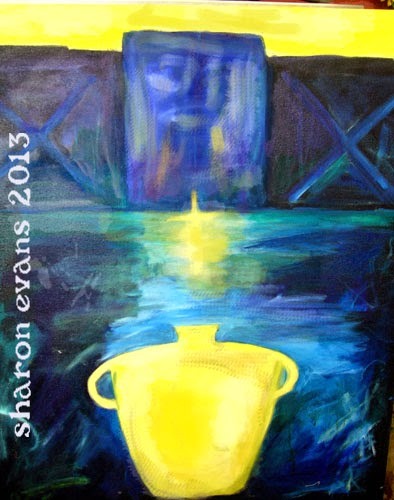 I am not sure about the pot at the bottom; I think it might need a lot of texture, perhaps hieroglyphics? Perhaps it needs to be in darker tones, time will tell. 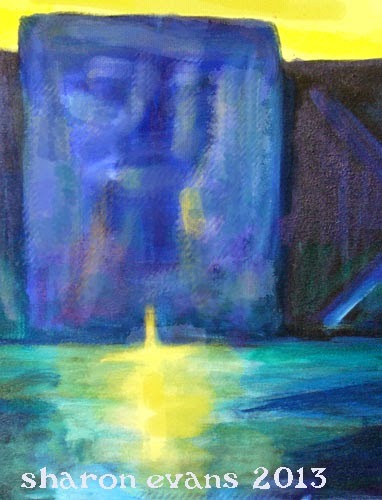 I have to say that I am really enjoying getting into oils again; I think that is where my heart is! I will post about this work again, maybe not next week but definitely the week after. Anyway on to a lighter topic. I am guilty of do a painting purely to match the colours in my bedroom! 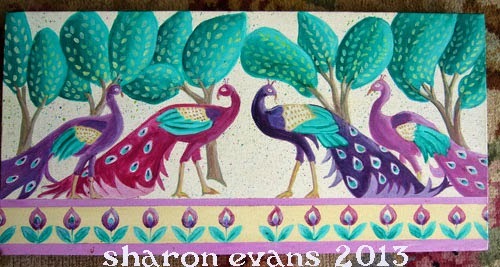 I love peacocks, and have wanted to paint them for ages. This is purely a decorative piece, and I got the idea from a wall frieze I saw ages ago. It is quite small 10in x 20in. I used acrylics and only took a short time to do and is already hanging in my bedroom. There, you now know the colour scheme in my boudoir! Have fun with those oils Sharon. I love the peacocks in all their splendor. I hope your friend comes out of her funk soon. I like the peacocks but already now, I love your oilpainting.. I must admit I thought you were speaking about this painting when you were talking about dark and light. It combines both, don't you think so? lovely contrasting pieces today. Ironic about the paint allergy. Like my hairdresser becoming allergic to his hair dyes. Hi Sharon. Love those peacocks and hope those gloves are keeping you from getting an allergic reaction. Yes, hope is what keeps us all going. We have to have hope. Thanks and Happy PPF! 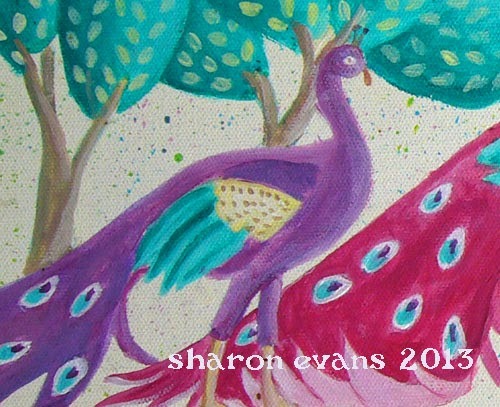 Hello Sharon, I love this beautiful peacock painting, a real favorite, the colors are so lovely and I love it all! Interesting work, the peacock is my fav! Loving the oils, very cool. I've never experimented with oils before, they scare me a little to be honest! Girlfriend we have the same colors in our bedrooms....only my walls are eggplant...but that painting would be perfect. I am in the process of changing it though....I have been trying to find a new color I want for 3 years now.... I have a new bedspread that fits with the walls now but I could go off that, but I may be changing to brighter colors this go round. Rather than the jewel tones of the past! Love both pieces, gorgeous! As for people who don't believe in a higher power...very sad for them. They know not what they are missing...it's always a relief to have someone to lean on and pray to in times of trouble...once you become aware you see how it manifests...it changes your life! Thanks for sharing your authentic self with such love! I hope your friend feels better and finds her light! I love your peacock painting! It's wonderful! The colors are great! I have not really gotten into oils since I was a little girl. I was thinking about picking them up again. We'll see. You made me think of them again!